There’s a startlingly involved blog entry on my pages from the book here. Also in the Nuclear edition are a whole gang was amazingly talented indivuals including Warwick Johnson Cadwell, Tom Neely and more. See the full list here. The book will be out in comic shops worldwide on the 30th of March. Here’s the Previews listing for it. If you’d like a copy, please get in touch with your friendly local comic shop (preferably an independent one like Gnash Comics or OMG Comics near me) and let them know. It might speed things up if you give them its code – JAN161028 – but that’s not essential. As part of the launch there’s going to be an exhibition at the Nucleus gallery in Los Angeles that runs from the 9th-24th of April, with an opening shindig on the 9th from 7pm-10pm, if you’re in California! So if you’ve not seen anything about Bartkira creep into your feeds yet, do seek it out, you can read it online for free, check the twitter hashtag or check the tumblr tag. It’s a truly amazing… Happening; it really makes you realise just how good a shape comics, illustration and the dizzy sense of genuine community are in these days. It’ll only get better too. Bartkira: Volume 3 and Animation Unleashed! 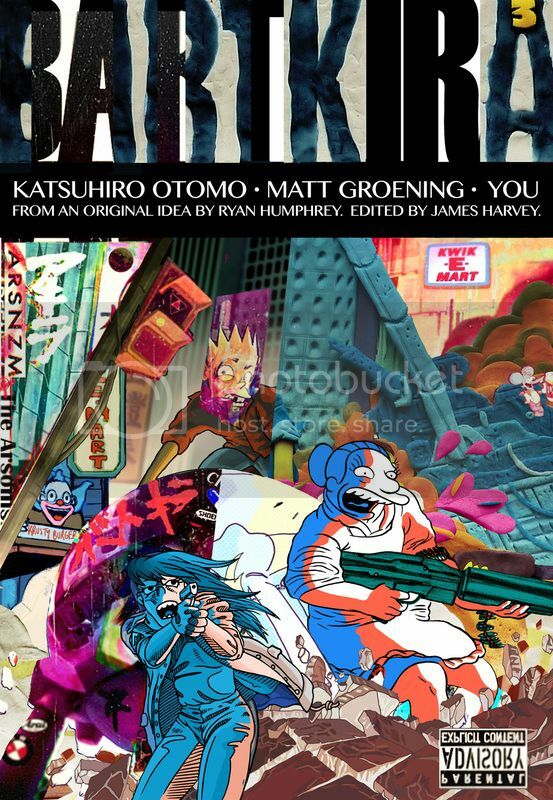 Woo-hoo Tetsuoo, today sees the release of volume 3 of the BARTKIRA project – the community drive overseen by James Harvey, Ryan Humphreys and Alex Jaffe where hundreds of artists redrew Katsuhiro Otomo’s 2,000+ page Akira manga with characters from The Simpsons! Click here or on the cover image to read it! The cover itself is made up of about six(?) different interpretations of the same Katsushiro Otomo image. You can recap my artwork for the project here. My pages run on p251 – 255 in the third volume, but don’t go skipping to them because there’s just so much fantastic art bursting out of this thing. Will there ever be a print version? Probably not, because of many different teams of lawyers in different countries would have so many problems with such an object existing. The internet helps us get it available in the ether though, and you can read the fruits of hundreds of artists’ labour online at your leisure. 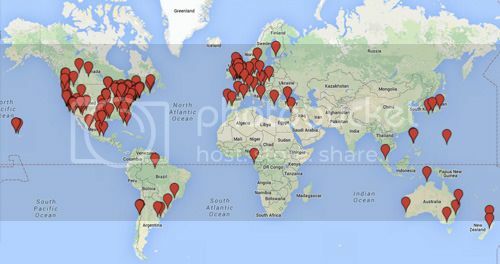 Also, there’s an online map compiled by Alex Jaffe here of where on – and all over – the globe all of the hundreds of contributors are! I’m on there with other local lad Jack Teagle, who I was really pleased to see was on-board on the project. 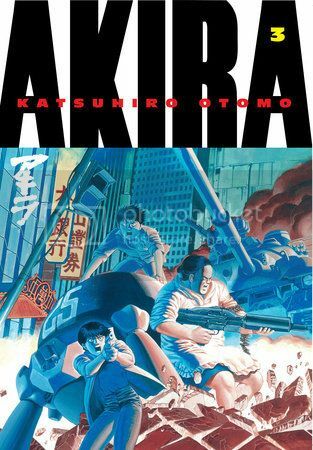 As if gallery shows in different countries, including Japan, the US and the UK, loads of press coverage – including me seeing one of my spread pages turn up in a ‘Best Fan-Art on the Web’ article on Buzzfeed – weren’t enough, the project’s now followed Akira’s jump from manga to cinema and has gone into the realm of animation! Another gang of amazing, talented people have now produced a re-animated version of the original Akira theatrical trailer with Simpsons characters set in Neo-Springfield! Sweeter than a squishie drink from the Kwik-E-Mart laced with government brain pills!